Because life is about change, you need a team you can trust to carefully orchestrate your most important transitions. When it involves Real Estate, the Cunningham Team shares a wealth of experience, articulate business prowess and personalities that exudes confidence in any situation. 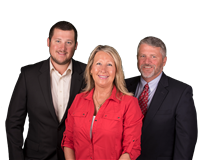 The Cunningham Team has established an impressive reputation among their peers and clientele as a knowledgeable resource for anything involving real estate in Citrus County. Also Business people interested in expansion, and or development of new business ventures within Citrus County look to our knowledge and insight as reliable resource for current market conditions. While attaining some of the highest honors given to business leaders in Citrus County, Kevin and Karen never forget that their clients are the key to their success. The extra hours, careful listening and honest evaluations of the marketplace, are a part of the consistently high standard of attention you will receive from the Cunningham’s. As a husband to wife Karen, and father to children, Courtney, Brogan, and Katelyn, Kevin maintains a delicate balance between work, play and community service. Alone, or as a family, Kevin enjoys the staples of Florida Nature Coast living; fishing, scalloping, golfing, and diving.